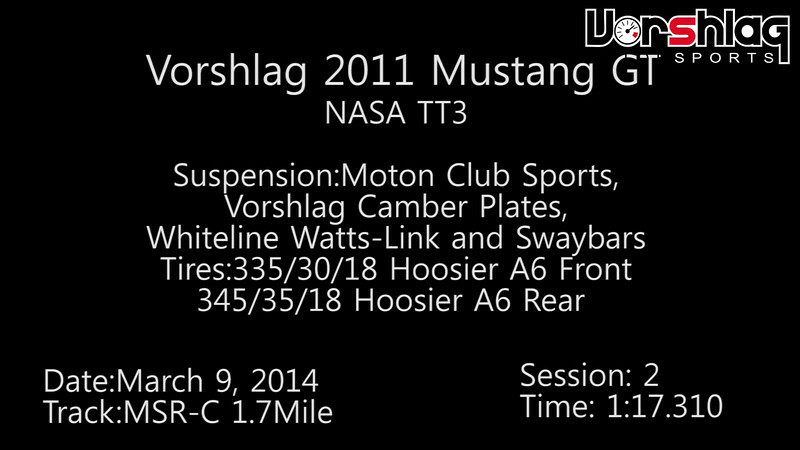 Terry drove the Vorshlag TT3 Mustang on a brand new set-up (432 whp, 3802 pounds, 335F/345R Hoosiers) this weekend on Friday (testing) and Sat-Sunday in NASA TT. Ended up with the 2nd fastest overall TT time Saturday and the TT3 win + track record. Sunday was a little faster but fell to 4th out of 35 in TT, with another win in TT3 and resetting the track record to a 1:17.310 on the MSR 1.7 mile course. This was a personal best at this track and 1.4 seconds faster than at the same track in January on 315mm tires.